FL vs. TX Rivalry: What Do Florida Girls Need to Do to Win? If you ask any Floridian, they have Florida for the win all the way. But, what do the stats tell us? We ran a virtual duel meet -- taking the top 2018 returnee performances -- between both outdoor power-house states to see who truly stands on top. Here is the scoop. With Florida's own Briana Williams, of Northeast HS, and Tamari Davis, of Oak Hall, leading the way with their US no. one and two 100m performances, it is no secret that Florida takes the cake with the top two places in this race and if we took a look at it on a national scale, the sunshine state would take the win. Here is where it gets tricky. Texas has depth like no other, with five girls taking the third-seventh scoring places with Kailei Collins of Cypress Ranch TX leading the way with her 11.45 PR. It's a close race in the 100m dash with TX beating FL 20 points to 19 points. Florida dominates the 200m dash winning the event with 25 points to Texas' 14. Davis and Williams continue to take the top two spots with Jan'Taijah Ford, of Northeast HS, taking fourth place and LaSarah Hargrove, of Gaither, wrapping up Florida's team with her 23.82 PR. Ford and Jatana Folston, of Cocoa HS, take the first two places against Texas' best 400m athletes. Fords' 52.52 and Folston's 53.04 have a significant lead over DeSoto TX, Cierra Wash's 53.76. FL wins the 400m with 21 points. Texas takes the win in the 100m hurdles with 27 points and Running Tigers TC's Jalaysiya Smith leading the way with her 13.62 PR. 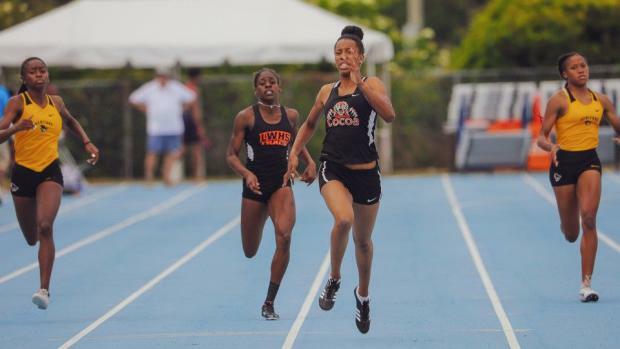 Miami Northwestern's Markalah Hart and Miami Southridge's Rayniah Jones holds it down for Florida with their predicted 3rd and 4th place finishes. What FL needs to do: Add depth to the sprints, we have a lot of talent, but we need more athletes in the hurdles and 100m -- this is where we lost our points. Floridians will have to step up their game in the relay department to keep up with Texas. Northeast HS and Miami Northwestern's 4x100m relay puts Florida on the map with their tied fifth place finish and eighth place finish in 46.08 and 46.09. Miami Northwestern and American Heritage's 4x200m relay clock fifth and sixth place finishes. The 4x400m brings Florida home with American Heritage, Miami Northwestern, and Northeast HS bringing the South Florida heat, sweeping third-fifth places going 3:40.58, 3:40.98, and 3:42.19. The South Florida heat in this duel won't be enough to beat out Texas power-house DeSoto or Duncanville in any of these relays. DeSoto clocks a predicted win in the 4x100m with 45.16 and 4x400m in 3:38.59. Could we see some FL vs. TX relay duels this outdoor season? What FL needs to do: Just with the sprints. We need to add depth. We have a lot of south Florida representation, but no teams predicted to score out of the central or north Florida areas. Our 4x400m is by far our best event when we are up against a state like Texas. Episcopal School of Jacksonville's own, Caroline Johnston leads FL in the long and triple jump with her predicted second and third places finishes of 6.17m for long and 12.39m for the triple. Dascha Robinson, of Miami Northwestern takes the predicted seventh place finish in the triple jump with her 12.19m PR. Unfortunately our sunshine state, Texas' depth gets the best of us by stacking the rest of the field. Shareya Newson, of Evans HS, dominates the girls shot put for FL with her 14.17m throw. Out-throwing Cypress Lakes TX's Keayla Dove for those ten points. Sydney Blackburn, of Highlands Christian Academy, nearly misses the ten point first place finish in the girls Discus throw with her 46.2m second place finish. Texas dominates in the pole vault sweeping the first-seventh place. Laine Roberts out of Bolles is the lone representative for Florida with her 3.85m PR to capture eighth place. Zatoria Thompson, of St. Thomas Aquinas HS, out jumps Clear Lake Texas', Tara Kessner, in the high jump for the win with her 1.8m PR -- shes only a junior this season! What FL needs to do: We are strongest in the high jump and throws by far, we need more scoring participation in the pole vault. It is a difficult event and will be fun to watch with the incoming freshmen who compete in the event as a club athletes join their high school FL teams this season. Texas' London Culbreath is a national competitor and a hard one to beat, she takes the first spot for the girls 1600m and 3200m with her 4:50.26 and 10:25.87. Florida hangs on to compete with Texas' competitive distance team. Valerie Lastra, of Mater Academy, Tsion Yared, and Claire Openshaw take the second-fourth places in the girls 1600m with their 4:52 PRs. Openshaw leads Florida in the 3200m with her sixth place finish in 10:36 with Yared and Rebecca Clark, out of the Villages following right behind. Not to mention, Florida's top distance athletes will all be back for the 2020 season -- talk about young talent in the sunshine state. Lastra's teammate, Jinah Mickens-Malik takes the lead for Florida with her predicted 800m win in a speedy time of 2:09. Patasha Bryan, of South Walton, is another Florida finisher with her seventh place finish in 2:11. Texas once again outmatches Florida in their pure depth having six out of the eight girls scoring. What FL needs to do: Florida's 1600m scoring squad is by far the strongest with 19 points to Texas' 20. We need more scoring athletes in the 800m that can go sub 2:11 -- with the amount of incoming freshmen FL has from strong middle school programs, there is no doubt we can fill this gap. In the 3200m we need more girls to dip under 10:40. Florida beats Texas by gaining more participating in the sport of track and field. According to the NFHS in 2014, Florida had 14,109 reported track participants compared to Texas' 59,850. Compared to state population numbers, Texas is not that far ahead of Florida, so that begs the question of "Why aren't more female athletes participating in outdoor track in Florida?" Now on a national scale, there is a strong possibility that Florida would beat Texas in a showdown with other states involved, but head to head their depth got the best of the sunshine state. Florida also has a very strong AAU and middle school program which allows us to have talented athletes emerge during the season and prove this duel meet ranking wrong. In order to win against Texas on paper, Florida needs to question: How do we get more participants and add to our nationally ranked depth? Paper is paper and anything can happen. Who do you have for the win: Florida or Texas? Vote below. Florida Girls vs. Texas Girls - Who has the win this season?